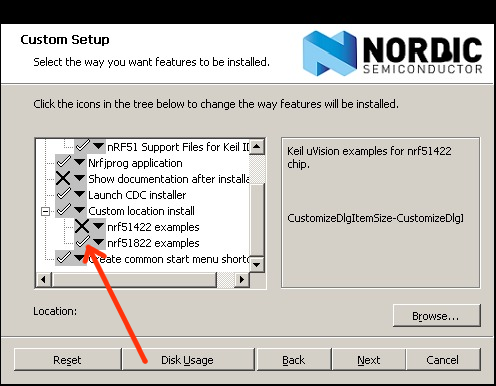 This tutorial tells you how to compile programs and program the flash of the nRF51822 on the evaluation kit board by Nordic Semiconductor in a Linux environment. It is assumed that you have purchased the "nRF51822 Evaluation Kit" (http://www.mouser.com/ProductDetail/Nordic-Semiconductor/nRF51822-EK/?qs=sGAEpiMZZMvQuebtxbmqHcwahSg6lJax). You basically need to download three things: The debugger driver, a GCC compiler with ARM Cortex support and the nRF518 SDK. There are 4 steps in this tutorial and it should be pretty straightforward. If you are using Ubuntu or Debian, you may consider looking at this page. After running these commands you should unplug and plug in the evaluation kit. The "45-jlink.rules" file ensures that you can program the nRF51822 as a non-root user also (as long as the user is a member of the group "plugdev"). The GCC version installed by default in for instance Ubuntu does not support ARM Cortex. It is possible to compile GCC yourself so that it supports ARM Cortex, but the easiest is by far to download the version from Mentor as explained above. You should be able to find a zip-file instead now on the web site called something like nRF518-SDK-ZIP. This one should be extracted somewhere convenient like /opt/nrf51sdk. You do not need to copy these files from where they are. It will suffice to create a Makefile that points to the correct location. Below is a basic Makefile that contains only the necessary things in order to compile the .bin or .hex file needed to program the flash. You can also find an example Makefile under /opt/nrf51sdk/Nordic/nrf51822/Source/templates/gcc which is more generic but perhaps a bit harder to understand. Download a simple .tar.gz project here: simple-nrf51822-linux.tar.gz. This contains the main.c file above, the Makefile and the Segger-scripts for programming the flash. In addition to the files mentioned above, this project uses the functions from nrf_delay.c and you can see in the Makefile above that "nrf_delay.c" is also compiled. while the evaluation kit is connected to the USB port, and the flash of the nRF51822 should be programmed and the LEDs should start flashing. Note! For some reason the Makefile will report that an error has occured after programming the flash. This does actually not mean that the programming has failed (if the LEDs have started flashing). You may also have to modify the path for the Segger-driver installation in the segger/segger.sh file. The next step now will be to modify the "main.c" file according to your wishes and recompile with "make install" and then see if the changes are reflected by the nRF51822! Please let me know in the comment field below if this tutorial worked for you or if you experienced any problems! You may now continue to the tutorial on how to program the BLE soft device from Linux: Part 2 -->. You do not have to erase the flash before every time you program above. However, this must be done if for instance the Bluetooth low energy Soft-device has been programmed onto the chip and you want to remove it. I just read the first comment! Doh! Thanks for posting that Scott. It appears that gcc_linker_script_nrf51.ld is no longer included with the SDK zip file. I just downloaded it and I don't see it at all. Any advice? Still very relevant info, thankyou for getting it down on paper! For those using the example Makefile you'll need to update for the latest changes to the Linker scripts. Add '-L"$(NRF51_SDK)/Nordic/nrf51822/Source/templates/gcc"' and change the template to '-T$(NRF51_SDK)/Nordic/nrf51822/Source/templates/gcc/gcc_nrf51_blank_xxaa.ld'. Or perhaps even xxab.ld if you have the latest silicon. Thanks a lot for putting this online! Please consider moving the note about the new upstream GCC toolchain up in the article. I only saw it after wasting a couple of hours on the old toolchain, -lnosys _start etc. Awesome tuto, thanks a lot !!! I had a few problems and I listed my workarounds here: https://github.com/honnet/twi/blob/master/README.md#workarounds I hope it helps ;) Cedric. @Joel I haven't solved the issue yet. It is always fail when installing embsysregview. And I have no .makefile. Hi! I bought the EVK but can't find a serial number anywhere on the boards. Nordic are slow to respond. I was wondering if you can help. I've tried the codes etched onto the n51822 but with no luck. Any thoughts? @Joel. You need only connect three wires between the eval kit and your standalone nrf51822: The SWDIO, the SWCLK and a ground pin. If you have the first release of the eval kit you will have access to the SWDIO and SWCLK on the jumper just above the Segger chip next to the reset button. Remove the two jumpers and connect wires to the two pins closest to the segger chip. When you remove the jumpers, you also remove the connection between the segger chip and the on-board nRF51822 which you will need. Then make sure that your standalone nrf51822 has power and then program the chip as you usual. Hi Sir, could you tell me how to set the developing environment in win 7? I have met some trouble when do so. I follow "Development_with_GCC_and_Eclipse_v1.0" from Nordicsemi, but failed on step "5. Repeat step 2 and add http://embsysregview.sourceforge.net/update to the list of repositories. 6. Install embsysregview.". I can't access the web address. By purchasing the evaluation kit for $99 (http://www.semiconductorstore.com/cart/pc/viewPrd.asp?idproduct=47965&cm_mmc=Symmetry-_-SemiStore_Link-_-Catalogue_Item_Listing-_-NRF51822-EK), you will be able to quickly start prototyping. I don't know of any particular license issues. The BLE stack may be downloaded from the Nordic Semiconductor web site for free after registering the evaluation kit. Hey,Thanks for the tutorial. I am not familiar with Nordic semiconductors. Was wondering if there are any license limitations when using their software? I have narrowed it down to the ble112 by bluegiga and this particular module.Leaning towards the nrf51822 if development is free.